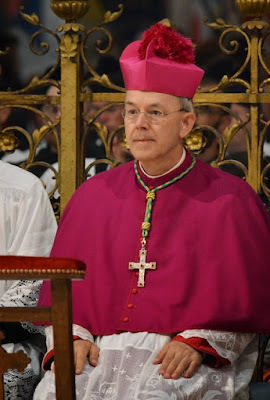 Readers in New England may want to know that Bishop Athanasius Schneider, who is becoming ever more widely known in traditional Catholic circles (e.g., here, here, and here), will visit Holy Ghost Church in Tiverton, Rhode Island, next week. On Tuesday, June 28th, at 6:00 pm, he will speak on the crisis of faith in the world today ($10 ticket required) and then preside at Solemn Vespers in the ordinary form (Latin and English). A reception in the church hall will follow. Copies of his book Dominus Est—It Is the Lord! will be available for purchase. On Wednesday, June 29th, at 6:00 pm, he will celebrate Solemn Pontifical Mass at the faldstool (extraordinary form) for the Feast of SS Peter & Paul. For tickets and more information, visit the parish website.